Don't sweat the small stuff, and it's all small stuff, they say. Do give thanks, for every small thing, they say. So, is the small stuff a pebble in the shoe, or a flower in the sidewalk crack? The fact that this book even exists makes me happy. The inspired ideas (poet-in-hotel residence, blurb-for-pay) and author interviews are quirky and fun. 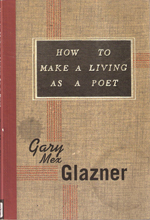 And the author, Gary Glazner, founded the Alzheimer's Poetry Project, so he clearly has a good heart. Go to a park and gawk. You could lead a beautiful revolution, if you wanted to. The more you indulge, the worse you'll feel. - Produces a gluten-free treat without sandpaper texture or cardboard taste. I love a deal, and I love clothes, so it's only natural that I love a great second-hand store. This week my $10 fashion find is small red checks with three-quarter sleeves. This could easily go fashion disaster so I'll minimize the bumpkin with heavy doses of camel or black — and call it country-modern.